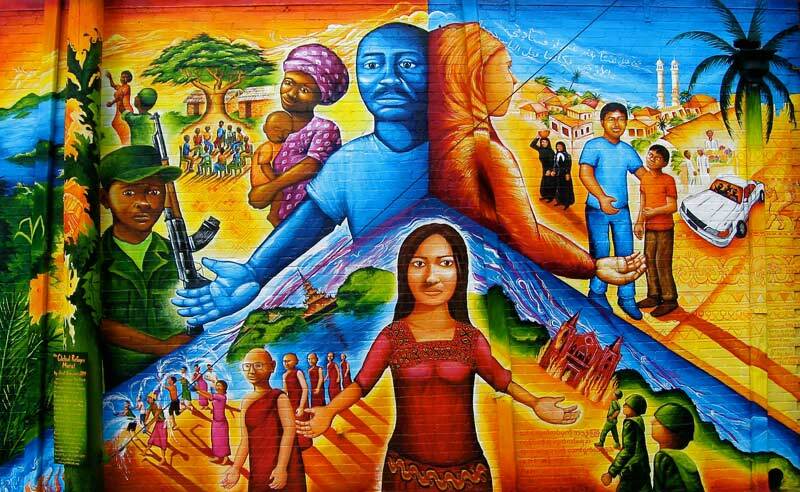 The murals aren't just limited to buildings, however. There is a large mural adorning a retaining wall on New Hampshire Avenue at Piney Branch Road in Adelphi. Murals like these are great because they take what would otherwise be a blank, imposing surface and make it something visually appealing. This mural on New Hampshire Avenue is a few hundred feet long. Photo by the author. In Four Corners, we have a few blank walls that could use some enlivening. The back wall of the 7/11 comes to mind, as does the wall of the Pepco substation at Sutherland and Timberwood. This wall is boring. Photo by the author. This wall on the Pepco substation could also use some artwork. Photo by the author. 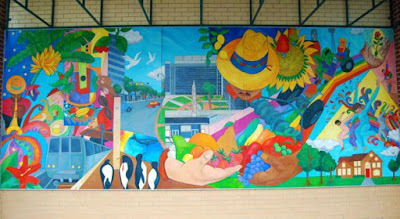 Some of the existing murals in the county were funded by grants from the Arts and Humanities Council of Montgomery County (AHCMC). Other murals may have been funded by businesses themselves or other nonprofits. Of course, public art doesn't just include murals. It can also be sculptures and other objects. The City of Takoma Park has placed brightly-colored rocking chairs at several bus stops in their jurisdiction, which provide both functionality and community character. Painted chairs at Devonshire Avenue and New Hampshire Avenue in Takoma Park. Photo by the author. Art isn't just something to look at, it's a sign of community character and civic pride. Four Corners could do a better job of demonstrating these things in highly-visible areas around the intersection, and art is a way to do it. 1) Who would decide the content/themes for the public art? The "public" or a small subset who follow social media? 2) Who would ensure that the public art is maintained and doesn't become a peeling, neglected eyesore that is more unsightly than the so-called "blank imposing surfaces" are? 3) We have some old buildings that may be historic. Painting brick facades accelerates deterioration and is irreversible. There are other ways to improve the aesthetics in Four Corners. A good start would be to convince business owners that landscape maintenance, trash removal, and other things required by county law are done. Another thing could be to revisit the 1996 sector plan discussions about aesthetics, public space, walkability, etc. so that we're not reinventing any wheels. Turning Four Corners into an urban neighborhood that it isn't doesn't strike me as the best way to explore who and what we are. Hi David, this is just a fun idea to make the neighborhood more interesting. The concerns you raised can only be answered on a case-by-case by the pertinent artist(s) and property owner(s). Also, there's nothing urban/suburban/rural about murals, they can be anywhere, from rural Kent County barns to apartment building in D.C. That's what's great about art, it's about celebrating community! Take it easy my man. If you look at street and public art - it is organic in nature. Store owners who decide to use their exposed wall for art purposes have the freedom to display their art aesthetic. Usually this incorporates a neighborhood theme or has some historical references. U street and Shaw have some amazing murals for reference. I don't know if it is about improving aesthetics as it is about creating a sense of place. So many of these public art areas end up becoming landmarks and it really gives a community an opportunity to display its rich cultural heritage. Four corners would be an excellent place for such urban art! I agree with Sean. Definitely does not need to be urban - we just see it more in urban areas. Love the idea! Good picture all of environment. Pretty much all the colors are not boring. Wow, what a beautiful thing. Thank you for this news. Of course, blogging is very useful.